I'm Maureen Shaughnessy, D.V.M., and my interest in animals, specifically dogs, was inborn, predating speech and organized thought. 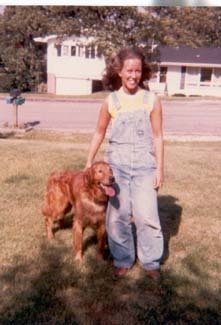 Allowed only one pet until adulthood, a cherished miniature poodle named with painstaking care "Garcon", I developed an acute interest in golden retrievers during adolescence, years before I ever had one. I knew from that early age that my first pet, once I was on my own, would be a golden. 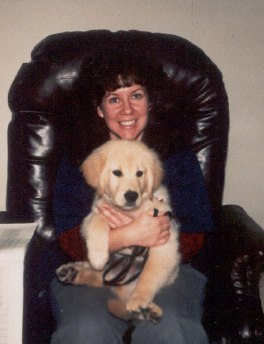 And my first golden, whom I dubbed "Boof", was a dog rescued from a Minnesota pound who was used as a "practice" dog in the Veterinary Technician program where I was studying. At the finish of that term, kennel dogs were offered for adoption in lieu of euthanasia, never allowed in previous terms. Boofy was a big, red dog, probably with a pretty random pedigree and was easily the best dog I'll have in my life -- the sun rose and set upon me for him. I obtained his ILP from AKC and he became my Novice A dog, made me appear to be a good trainer. He was trained through his CDX, but his title was postponed too long as I entered and became bogged down by veterinary school. I lost my Boofy in my senior year to splenic hemangiosarcoma, a heartbreak that pains me still. There will never be another like him. So, wanting to always have goldens and trying not to feel as if I was replacing the irreplaceable Boof, I decided to look at show puppies to fill the terrific void that he left. Connections through my vet school roommate, Dr. Denise Travis, and her professional show handler friend, Coral Appleton, led me to a pretty show litter bred by Gloria Kerr and Karen Rubin where I found my little, blond fuzzy who would go on to become novice owner trained and handled Ch Krishna's Eddington of Sabra, CDX, JH, WC, VC, OS and lead me to a lifetime addiction to living and competing with golden retrievers.